People travel from near and far to seek our unique and different approach to getting off pain meds, avoiding surgery and truly living…happier, healthier, stronger and longer. 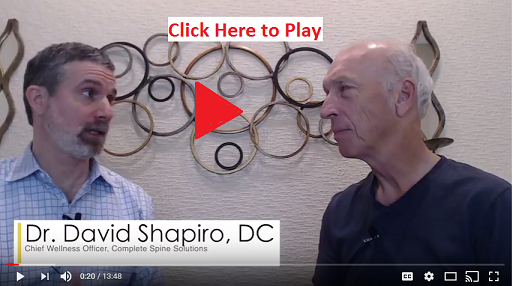 This is an interview that took place between Advanced Certified Chiropractic BioPhysics Doctor, David Shapiro, and Complete Spine Solutions patient, Bob Moseley. Bob just finished his first phase of spinal corrective care at Complete Spine Solutions. Dr. Shapiro asks about his journey to getting off the pain train that was leading him to spine surgery. Dr. Shapiro (DS): Bob, can you please give us an overview of your journey to a pain-free life? Bob Mosely (BM): I had a herniated cervical (neck) disc for more years than I want to acknowledge. I was in constant pain. I saw a variety of medical practitioners and I went to an Orthopedic Surgeon. There I had a series of epidural injections which created a temporary numbing but wasn’t much help at all. I went to a lot of physical therapy. Then I had to take Celebrex for pain relief. That was so harsh on my stomach, I had to take another prescription – Nexium. My physical therapy continued, but the pain just kept getting worse. The surgeon said he had only one other option, cervical (spine) fusion. I was aware of Complete Spine Solutions, as I live near the Tucker, GA location. I said, “Let me try just one more thing before I end up having surgery”. So I came here three months ago and started the Spinal Correction Protocol and got almost immediate relief! In only a few weeks, I stopped taking the Celebrex and Nexium with no problem at all. I thought I was going to have a lot of pain as I did before, but there was none. Now I’m able to sleep for 8 hours every night, drive without pain, and work on the computer without pain. I love to cycle, but that was a real aggravator for my disc herniation. Now I can cycle as much as I want without any pain. I never thought I would have this much relief. I am very pleased! DS: What kind of demands does your job have on your body? BM: I am a retired school principal and I work half-time consulting with principals in Clayton County. I drive the long distance and do consulting which involves a lot of computer work. I am able to do all that now without any discomfort at all. DS: I know you have been on this road for a really long time to get better before you ever came to us. I also know you have spent a lot of money on treatments that were not effective. BM: I have spent a lot of money. Many epidurals, tons of physical therapy, and visits to doctors who did not help. Even though there is an investment associated with coming here, it’s money well spent. It’s small compared to the other costs I incurred seeking ineffective treatment and the cost of potential surgery. It’s very small. DS: Can you please describe your treatment in our office? BM: With the Spinal Correction Protocol, I do 3 different exercises specific to my spinal structure. In addition, I get my spine adjusted on the specialized table for this corrective technique. Then I lay on the traction table on a spinal orthotic for 15 minutes. I started with very light weight, which was a challenge. Your staff encouraged me and patiently worked with me to persevere. Now I am up to 12 pounds! Additionally, I do 15 minutes of customized home traction to keep my spine moving in the right direction between visits. DS: That’s awesome!! Are your treatments painful? Many people are concerned with the popping or cracking that they hear when they get adjusted. BM: I was also concerned at first. I didn’t want to hurt myself further, and I thought that might possibly occur. The adjustments are painless, and they relieve a lot of tension. The traction table progressively stretches, and each time I hit a new milestone, I can really feel it, but it isn’t painful, and I know I am maximizing the stretch. If you want your spine to move in the proper direction, without surgery, there is bound to be some discomfort, but there is no pain – just the pleasure of knowing that I am helping my current and future health be the best it can be! DS: Tell me about the logic behind the treatment and how it makes sense to you. BM: As I learned from you and the other doctors at Complete Spine Solutions, the point is to restore proper spinal structure because, without proper structure, the function of the body is compromised. And I was experiencing that. My spinal structure was out of alignment, putting pressure on my nerves and discs. The source of my pain was my poor spinal structure. Fixing it at CSS has worked very well. DS: What is your goal with treatment? BM: I was so pleased to get off the medication. It wasn’t even an initial goal of mine because I couldn’t imagine being able to go without it. That was a huge relief to be free of them. I just want to be healthy, pain-free, able to sleep, cycle, and have an active lifestyle. DS: There are many people out there who are contemplating having surgery, and people who are taking medication and are addicted to the medication. They can’t go a day without it, just like you experienced. What would you say to those people if you could talk to them? BM: I remember how much pain my cervical disc put me in. Absolutely check out every kind of treatment available, starting with CSS’ unique and different chiropractic treatment. That is where I got all my relief. I got almost no relief from anything else I tried before. DS: Complete Spine Solutions is very unique and different, even compared to other chiropractors. Since this is your first chiropractic experience, it is understandable that you might think all chiropractic is the same, but it’s really not. Most chiropractic offices offer temporary pain relief, where the physical problem doesn’t resolve, but just gets treated over and over again for temporary relief. There are other “corrective” practices around, which offer the exact same treatments to every patient. But does that make sense, if every patient presents with a different spine? Our protocols are completely customized to each patient’s spinal biomechanical needs. We get to the SOURCE of the problem – and FIX IT, for long term optimal health. That’s what really makes us unique and different. Our outcomes are exceptional! We customize the protocol for each individual; we improve spinal mechanics and make objective, measurable, visible changes. DS: We just took an x-ray of your spine. What did you see? BM: Great improvement! The curvature is returning to my neck and my head is in a more appropriate position in relation to my body. Overall, just a lot of improvement in my spinal structure! DS: It’s not just about being able to say, “Hey, I feel better”, which is great for the short term and what you originally wanted. But now you can say, “I AM better! My structure actually has improved!” Now you can do things again that you were unable to do, and have the best structure to support you in this gravity environment we all live in, for many, many years to come. DS: Would you mind sharing the changes that fixing your spine has had on your life? BM: I have had a 95-100 improvement in all of the following areas: neck pain, shoulder pain, trapezius pain, and difficulty with sitting and sleeping, which affect so many different aspects of life. Now I can sleep through the night; I had interrupted sleep all the time. Cycling, working at the computer, and driving was also very painful and they all have improved by 95-100% as well! DS: Getting off Celebrex has helped your body function better because those medications are really bad for your body. Recently we talked about how Celebrex and non-steroidal inflammatory drugs are proven to cause heart attacks. Getting off that drug is really important for someone who wants to be healthy and push themselves like you do. You were also taking Nexium for the side effects of Celebrex. To be free from medication must feel fantastic. BM: It does feel fantastic! Your whole team has been great to work with. DS: Spine surgery runs over $100,000, not including recovery costs and a high re-operation rate. We have been successful in restoring your health, without going through all the pain and risks of surgery. In addition, so many who undergo spine surgery become addicted to opiate medications. They are often in constant, chronic pain and usually don’t return to the workforce. That’s the path you were headed. We are so glad you found us! Are All Chiropractic Techniques Equal?